The figure resembles the Chinese character "Jing", which stands for the name of the host city and represents a particularly significant Chinese style. 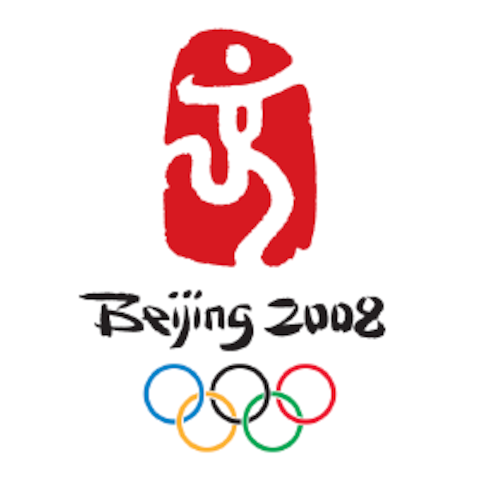 The artwork embodies four messages: * Chinese culture, * the color of red China * Beijing welcomes friends from all over the world * to challenge the extreme and achieve the perfect and promote the Olympic motto of "Citius, Altius, Fortius (Faster, Higher, Stronger). The mascots correspond to the five natural elements and, apart from Huanhuan, to four popular animals in China. Each mascot represents the colour of one of the five Olympic rings. Each also bears a wish, as it was traditional in ancient Chinese culture to transmit wishes through signs or symbols. Beibei the fish is a reference to the element of water. She is blue and her wish is prosperity. The waves on her head are based on a design in traditional Chinese painting. Jingjing the panda represents the forest. He is black and his wish is happiness. Porcelain paintings from the Song dynasty (960-1279 AD) were the inspiration for the lotus flowers on his head. Yingying, the Tibetan antelope, represents earth. He is yellow and his wish is good health. Decorative elements from Western China appear on his head. Nini, the swallow, represents the sky. She is green and her wish is good luck. Her design is inspired by those on Chinese kites. Swallow is pronounced “Yan” in Chinese, and an ancient name for Beijing was “Yanjing”. Huanhuan is a child of fire. He is red and transmits the passion of sport as well as symbolises the Olympic flame and spirit. Dunhuang grotto art inspired the decoration on his head, together with certain traditional good-luck designs. The Organising Committee invited graphic designers and communications agencies all over the world to send their suggestions for mascots for the Games and attracted more than 3,000 submissions. A series of 100 cartoon episodes entitled “The Olympic Adventures of Fuwa” was shown on more than 100 television channels throughout China, on the public transport system in Beijing and on China's nationwide rail TV networks.